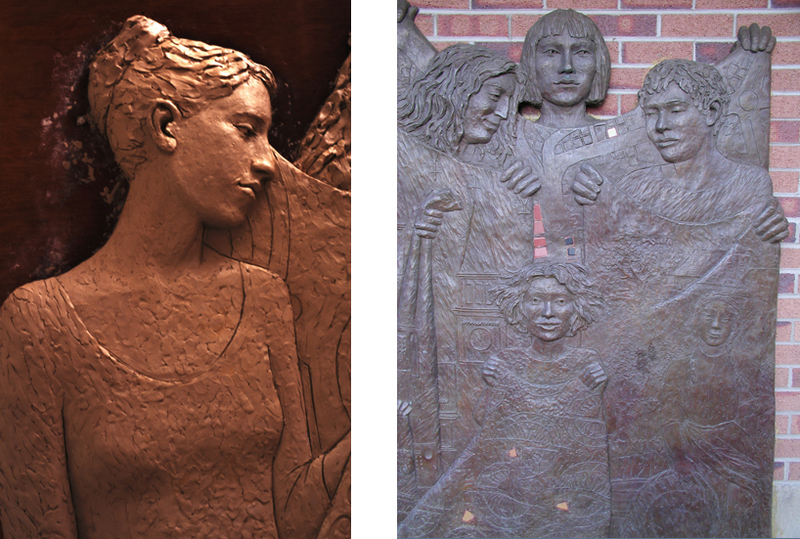 Diane designed and modelled in clay this commission for two bronze relief panels. They are approx. 2m square and installed on the Cleveland Street wall of the market, on either side of the entrance. The bronzes depict groups of women holding up lengths of cloth. Each cloth has surface patterns based on subjects connected to Chorley and the Market eg; Chorley Cakes. The bronze spills onto the ground and the patterns are taken up by mosaic laid into the surrounding paving. Mosaic is also set into the bronze relief so that the bronze gradually merges into the mosaic. Tracey Cartledge was engaged to design and produce the mosaic. The bronze reliefs were cast by Castle Fine Art Foundry. These images show details of the clay and bronze work and the rollover image shows the work in situ.